Emergencies such as the terrorist attacks in Mumbai and the 2009 helicopter crash in the North Sea require responses that are prepared and coordinated. Psychology has a role in this, if it can be sensitive to the social inequalities that exacerbate difficulties and can work collaboratively with communities to facilitate their resilience and enhance coping. In this article I give examples from the British Red Cross across a range of national and international contexts, and make recommendations about how psychologists might work more effectively with communities and the voluntary sector. Psychosocial has been usefully defined as: ‘the dynamic relationship that exists between psychological and social effects, each continually inter-acting with and influencing the other’ (Save the Children, 2005). In recent years the major humanitarian aid agencies have implemented ‘psychosocial programmes’ requiring adequately trained personnel. In 1990 Médecins Sans Frontières (MSF) began its first psychosocial programme in Gaza (Palestine). The programme focused on developing people’s self-help skills and on addressing both the social and psychological effects of violence (MSF, 2006). In 1991 the International Federation of Red Cross and Red Crescent Societies (IFRC) established psychological support programmes, and in 2004 the Federation’s centre of excellence supporting this activity adopted the title ‘Reference Centre for Psychosocial Support’, reflecting ‘the close relationship between the individual and the collective aspects of any social entity’ (IFRC, 2009). In recognition of this emerging field for humanitarian agencies, the United Nations commissioned guidelines on mental health and psychosocial support in emergency settings. The result was the Inter Agency Standing Committee’s (2007) guidance which defines ‘psychosocial support’ as ‘any type of local or outside support that aims to protect or promote psychological well-being and/or prevent mental disorder’ (IASC, 2007, p.1). In common with other guidance (e.g. NATO, 2008) the IASC (2007) emphasises that psychosocial elements must be included in all assessments, interventions or evaluations following any kind of emergency anywhere around the world. The British Red Cross endeavours to do this as part of the Red Cross and Red Crescent Movement, which is the world’s leading crisis response organisation. The Red Cross and Red Crescent Movement has its origins on the battlefield of Solferino, when in 1859, a Swiss citizen named Henri Dunant was horrified by the sight of 40,000 dead and wounded, many of whom were left to die by virtue of being far away from their own sides. Dunant was struck by the consequence of partiality, and moved to advocate for those caught up in conflict. He called for the establishment of ‘relief organisations’ to be formed in peacetime, involving volunteers who would be ready to care for the wounded in times of war. He believed such organisations should be recognised and protected through international agreement (Dunant, 1986). His campaigning led to the formation of the International Red Cross (using an emblem that was the reverse of the Swiss flag) in 1863, and the first Geneva Conventions. There are Seven Fundamental Principles that guide and underpin the International Red Cross and Red Crescent Movement; these are: Humanity, Impartiality, Neutrality, Independence, Voluntary Service, Unity and Universality. The relief organisations that Dunant envisaged became National Red Cross and Red Crescent Societies, of which the British Red Cross (BRC) is one. In the UK the BRC responds to emergencies and builds people’s capacity to withstand and recover from them, such as by providing first aid training and services at public events. Services are delivered to people at risk of vulnerability – where people’s resources are outstripped by the circumstances in which they find themselves, placing them at risk of ill health, harm or exploitation. Opportunities are provided to promote support for humanitarian action through volunteering and advocating for marginalised groups, such as asylum seekers. a framework was developed to underpin the organisation’s psychosocial approach and responses. While awareness of psychosocial principles has been evident in the BRC for many years, in December 2008 a single psychosocial framework was adopted across all services and departments. The framework, known as CALMER, drew from a range of ways psychologists have of conceptualising and responding to the multidimensional psychosocial needs of individuals and communities. The impact of social inequalities on individuals’ and communities’ abilities to respond to crises and access services was acknowledged (Friedli, 2009) as was the diversity in people’s experiences and backgrounds and the need to tailor responses to these (Patel et al., 2000). Coping and resilience were emphasised and fostered at individual, family and community levels, through the provision of information, facilitation of social support and promotion of self- and community efficacy (Cloak & Edwards, 2004; Flannery & Everly, 2000; Hobfall et al., 2007). These principles were integrated into a single framework that aimed to be accessible and applicable to all working with and within the BRC. CALMER reminds responders to be calmer and more thoughtful in their responses (particularly when crises often create adrenaline rushes that work against feeling calm). CALMER is also an acronym designed to cue six sequential stages in any response: Consider, Acknowledge, Listen, Manage, Enable and Resource. The first two stages address the importance of considering risks and needs and acknowledging diversity (in the contexts and the characteristics of those being responded to, for example the particular needs of children). Consideration is given to how responders might facilitate trust and develop rapport. This is further underlined within listening skills, whilst the fourth stage addresses the need to promote dignity and respect, through the management of confidentiality for example. The Enable and Resource steps draw from community psychology and particularly the importance of empowerment of both individuals and communities to affect not just coping, but social change and greater resilience for the future (Orford, 2008; White, 2008). Throughout the steps, the needs of those responding are acknowledged in order to prevent further harm to themselves or others. Once the framework had been independently piloted with different populations in different countries (Davidson, 2010), it was incorporated into operating manuals across the organisation. The framework was also used to develop training for staff, volunteers and members of the public. Examples from the BRC are now considered in order to demonstrate the public relevance of psychology in global and national situations. One of the first areas to include the new framework was first aid training. The need to establish a trusting relationship, often very rapidly, is vital to the delivery of effective first aid. Without such a relationship, important information may not be gleaned and key developments in the injured person’s experience and condition may not be ascertained, leading to potentially dangerous omissions in care. Also fundamental to a first aider’s success is the ability to put others at ease, to convey compassion in order to reduce anxiety (Fogarty et al., 1999) and by doing so reducing pain and promoting physical wound healing (Kiecolt-Glaser et al., 1995; Woo, 2008). By including psychosocial elements in the first aid curriculum, such as listening skills, the emotional, relational and communication aspects are recognised alongside the practical as part of a holistic and integrated response. Many first aiders reported including (some of) these aspects previously; however, by integrating a systematic framework through which psychosocial care can be communicated and delivered, key factors relating to the injured person’s experience can be legitimised and addressed together with the needs of the first aider. In 2008 the British Psychological Society awarded the British Red Cross £5000 as part of its Public Engagement Grants. This money is being used to support communication of the new CALMER framework through a range of media and enhance understanding of the importance of including psychosocial elements in building capacity and resilience. Knowledge of first aid can lead to greater resilience, especially in the face of an emergency. Community-based first aid recognises this and trains communities facing increased risk (e.g. carers and people who substance misuse) to be able to respond when crises (e.g. falls or overdoses) happen to those nearby. Community psychology uses similar principles: fostering mutual support, building social capital, promoting life skills and combating stigma and poor integration in order to improve physical and mental health for the whole community (Orford, 2008). This type of approach is also exemplified within the Peer Educators, where young people trained in first aid go into their own and other schools and train others of similar ages and receive a more positive response and greater engagement than their adult trainers could achieve. Partnerships are essential in whichever context: national or international. The BRC works with other organisations to provide psychosocial support following large-scale international crises. The movement’s International Tracing and Message Service has recognised the importance of facilitating contact with supportive others for over a century. Working through National Societies, people who have lost contact with one another through crises such as conflict or natural disaster are reunited. Those wanting to find a loved one may also learn of the death of that person. Trained staff and volunteers deliver this news to people with tact and sensitivity. However, they too require support to endure the absence of information, as well as news of death. The psychosocial support team collaborates with the Foreign and Commonwealth Office (FCO) in responding to UK nationals caught up in large-scale crises around the globe. Beginning with our response to the tsunami in 2004, this team, which includes psychologists and people with extended skills and experience in providing psychosocial support, has responded to dozens of crises around the world; including the Pakistan earthquake, hurricanes in Mexico and the terrorist attacks in Mumbai. This team is part of the FCO’s rapid deployment teams, offering professional support to survivors – bereaved and members of the local community – in the aftermath or during the continuation of a crisis. In addition to working with individuals to strengthen safety, normalise responses and facilitate information sharing, consultation is offered to promote prevention and early intervention. For example, following the bombing of the Players Theatre in Doha, Qatar in 2005, the nearby school – which had many of its windows blown out by the bombing – received support in managing the gradual return of staff and young children. Firms with employees involved in the sinking of the dhow in Bahrain in 2006, were encouraged to provide culturally appropriate rituals for people to express their grief and understand the diversity of people’s responses. Those who volunteer in this team are required to undertake updates and remain committed to an on-call register. Over time, familiarity and preparation has led to greater clarity of roles and mutual understanding. Further evaluations will reveal more about what has been experienced as useful. Crises require responses that are coordinated, practised and prepared for. With over 33,000 volunteers in the UK, this means providing appropriate training, supervision and updates to ensure skills remain relevant. But this is not done through emergency-response training alone. In the UK a range of services are delivered that relate directly to those in situations where they may become vulnerable. Thus, the Red Cross works with migrating populations, many of whom are fleeing famine, persecution or crisis in their countries of origin. Orientation is provided as well as befriending to minors and new arrivals who find the UK a strange and unnerving place. Teams of volunteers introduce them to important services, statutory and voluntary, such as enabling their access to health care and interpreters. In 2007, 500 volunteers assisted over 44,000 refugees; of which over 34,000 were destitute. Of those 500 volunteers, almost half were refugees or asylum seekers themselves, individuals who had crossed the globe and overcome various physical and concurrent threats, who were now providing support, orientation and education to others in similar situations. This example of reintegration, empowerment and recovery of independence and dignity is one to celebrate, but also to understand. How can humanitarian agencies and psychologists support more people who have been affected by crises to be involved in the planning of services to meet their needs and those of others in similar positions? If we are serious about capacity building, truly enabling people and developing community resilience, we need to understand these processes better and participate in partnerships. Critical is the ability to work with and through others – others more similar in history and experience to those affected; others who are in better positions to know about the nuances of services needed and be sensitive to the implications of different contexts that might otherwise be overlooked. If psychologists are to ‘do a much better job in working with communities and the voluntary sector’ (Gilbert, 2009, p.403) with all the skills, knowledge and experiences we bring, we must make ourselves known, forming meaningful partnerships with a range of stakeholders, in order to prepare, enable and understand. We must do this critically, aware of the limitations of our theories and with an openness to learn. Preventative work in the humanitarian field relies on our being sensitive to social contexts and aware of the full range of inequalities that prevent people accessing the resources they require. With the current global financial crisis, this is even more salient. Being prepared means working better together – working with others who have the skills, capacity and readiness to scrutinise, learn and better understand. The Red Cross does not do this alone, but in partnership with others – across the world and around the corner. The earthquake that hit Haiti on 12 January 2010 struck a huge and devastating blow to a country that was already coping with widespread poverty. Hundreds of thousands of people have lost their homes, their family, and their jobs. 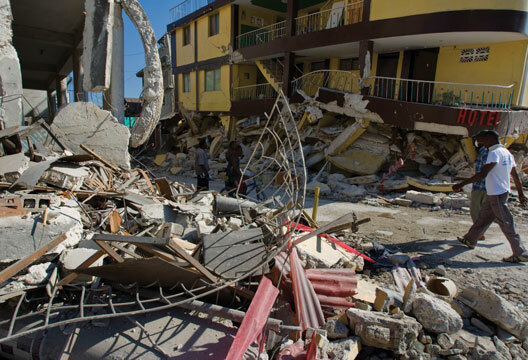 The earthquake has had a devastating impact on Haiti’s basic infrastructure as hospitals, school and government buildings were razed to the ground. Six weeks on and the Red Cross is in the midst of their largest-ever single-country emergency response. More than 600 staff and volunteers from 22 countries are working to bring relief to people who are living in camps in the cities of Port-au-Prince, Leogane and the surrounding areas. The emergency response phase will not be over for some time to come, and the Red Cross will need to meet basic life-saving needs such as access to clean water and basic shelter for many more months. Work on the recovery phase has begun, but the scale of devastation means this will be a long-term undertaking lasting several years. As part of the initial response, the British Red Cross sent a psychosocial support team to help Britons affected by the disaster. Two of us travelled to Haiti as part of a Foreign and Commonwealth Office (FCO) Rapid Deployment Team. We took it in turns to accompany members of the Foreign Office’s Rapid Deployment Team visiting UK nationals in Port-au-Prince who had been affected by the Haitian earthquake. The devastation was overwhelming. Many buildings were completely destroyed, others partially collapsed. One family we met had managed to escape. They recounted their tales, still disbelieving that they had all walked away. However, their friends and neighbours were amongst the dead and missing. The family camped with others out in the road, to avoid further falling debris. Our office space was a makeshift shelter in the shadow of some trucks in the UN compound. From there, we tried our best to contact people despite the patchy phone and internet coverage. We talked to them, offering support and to pass messages home. Importantly, we did not encourage people to recount their painful experiences, but offered first-hand assistance, often with practicalities such as facilitating contact with significant others and sharing information about the resources that existed. Amidst the action that surrounded us, we provided a place where people could be supported, their experiences validated and their needs – including for safety – acknowledged and promoted. Networking with other agencies enhanced communication and coordination. Our involvement was brief so ensuring that people knew where resources existed and how to access these was critical. As well as dealing with the aftermath of the earthquake, there was the constant threat and reality of aftershocks. One afternoon we visited a group of nuns who had been supporting their local community for many years. They continued to do so, whilst living in the tented city next to their damaged house. Their tent, which they shared with six others, was next to two water tanks provided by the Spanish Red Cross. While I was there, the ground shook violently, sending children running into the middle of the road, scared for their lives. Cloak, N.L. & Edwards, P. (2004). Psychological first aid: Emergency care for terrorism and disaster survivors. Current Psychiatry, 3, 12–23. Davidson, S. (2010). The development of the British Red Cross’ psychosocial framework: CALMER. Journal of Social Work Practice, 24, 29–42. Dunant, H. (1986). A memory of Solferino. Geneva: ICRC. Flannery, R.B. & Everly, G.S. (2000). Crisis intervention: A review. International Journal of Emergency Mental Health, 2, 119–125. Fogarty, L.A., Curbow, B.A., Wingard, J.R. et al. (1999). Can 40 seconds of compassion reduce patient anxiety? Journal of Clinical Oncology, 17, 371–379. Friedli, L. (2009). Mental health, resilience and inequalities. Copenhagen: WHO. Gilbert, P. (2009). Moving beyond cognitive behaviour therapy. The Psychologist, 22, 400–403. Hobfall, S.E., Watson, P., Bell, C.C., et al. (2007). Five essential elements of immediate and mid term mass trauma intervention: Empirical evidence. Psychiatry, 70, 4. Inter-Agency Standing Committee (2007). IASC guidelines on mental health and psychosocial support in emergency settings. Geneva: IASC. Kiecolt-Glaser, J.K., Marucha, P.T., Malarkey, W.B. et al. (1995). Slowing of wound healing by psychological stress. Lancet, 346, 1194–1196. NATO (2008). Psychosocial care for people affected by disasters and major incidents. NATO. Orford, J. (2008). Community psychology: Challenges, controversies and emerging consensus. Chichester: Wiley. Patel, N., Bennett, E., Dennis, M. et al. (2000). Clinical psychology, ‘race’ and culture. Leicester: BPS Books. Woo, K.Y. (2008). Meeting the challenges of wound-associated pain. Ostomony Wound Management, 34, 54(9), 10–12.